Romance meets reality in France. A place like no other, France throws open a plethora of grandeur in every nook and corner. Here are the most popular tourist attractions in France you must visit. The sheer opulence and grandeur of the Palace of Versailles leaves one awestruck. The château palace is located in Versailles, Île-de-France region of France. 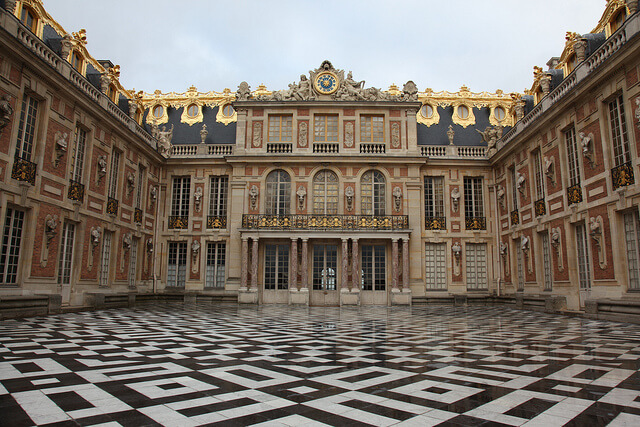 Decked with priceless art and porticos, The Palace of Versailles is a stunner with its intricate architectural design. No trip to France is complete without a visit to the Eiffel Tower. A mainstay in many wonders of the world list, The Eiffel Tower rules the Paris skyline. The view of Paris from atop the tower is breathtaking. Therefore, it is mandatory to visit this magnificent structure while you are in France as without a trip to the Eiffel Tower, your France tour would be rendered useless. When you travel to France u could ignore missing a loved one but one should simply not miss the visit to Musse de Louvre or the Louvre Meuseum. Literally the treasure trove of the greatest collection of Art and artifacts of a period spanning over 2000 years, the Louvre is not the kind of museum one can cover in a day, make sure you reserve substantial amount of time for a trip to this heritage museum. Da Vinci’s world renowned Mona Lisa is exhibited here. Situated in Vezere Valley region of France, one of the most sought after tourist attractions in France, Grotte de Font de Gaume. A part of a labyrinth of caves from prehistoric times in Les Eyezies, Grotte de Font de Gaumme is a UNESCO World Hertiage Site. A medieval town atop a rocky terrain, Mont Saint-Michel ia a picture out of renaissance period poetry. Situated in Normandy, Mont Saint- Michael is a must Visit for anyone visiting France. Considered the best preserved Roman amphitheater, Nimes Arena is considered a spectacle and a must visit for anyone visiting France. Some even consider Nimes Arena better preserved than the Colloseum. The interactive audio-guide takes spectators closer to the Roman era. France throws open a plethora of grandeur in every nook and corner. Here is a list of the most popular tourist attractions in France.